Swrve provides several predefined templates that give you a starting point for adding different types of content to your Conversation campaign. The templates include default images, text, and buttons. You can edit the default content at any time, including removing or adding pages as needed, and customize the pages using any combination of text, images, video, or survey questions. This article describes the different templates available when you create a new Conversation campaign. 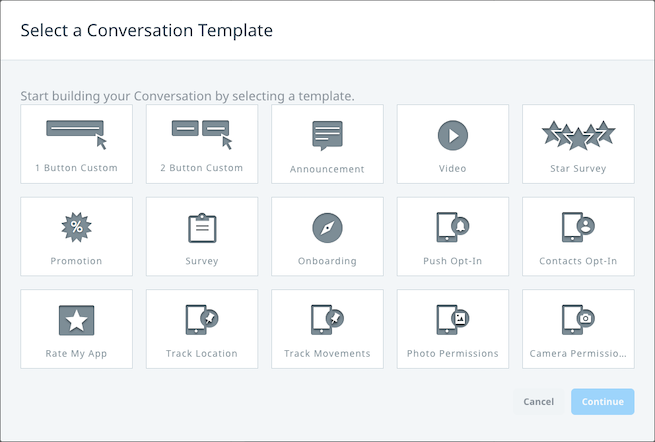 For more information about the overall campaign workflow, see Creating Conversations. For information on how to edit the content of your Conversation, see Editing Conversations. The 1 and 2 Button Custom templates provide a basic and flexible option for creating pages that you can easily customize with your own content. The initial page includes a blank space with one or two buttons. You can then edit or add additional content (text, images, video, survey questions) and customize the button text or actions as needed. The Announcement template enables you to create an announcement message, with placeholders for an image, headline, message text, and one button. You can edit or add additional content as needed. If you want to create an announcement that includes two buttons, use the Promotion template. The Video template provides an example of a video announcement that you can customize with additional content. Use the embed link from a YouTube video to display and play the video directly on the page. The Star Survey template enables you to present a simple star rating survey—for example, “How would you rate this app 1-5 stars?” You can edit the color of the stars and include more than one question on each page. The survey results display on the Campaign Report tab after the Conversation is launched. The Promotion template is similar to the Announcement template but includes two buttons, enabling you to configure one button as a cancel and the other as a link to more information (which in turn could be any other button action—for example, another conversation page, web page, app deeplink, call a number, and so forth). The Survey template enables you to present a simple survey with a single question and multiple choice answer. You can edit the number of options available and add additional content, including other questions, as needed. The survey results display on the Campaign Report tab after the Conversation is launched. The Onboarding template includes three default pages with placeholders for the typical messages apps use during onboarding to maximize user engagement after the initial app install. You can also use the Onboarding template as a basis for any multi-page Conversation, which you can then customize as needed. The Push Opt-In template enables you to create a message that encourages users to consent to receiving push notifications from your app. Use this template to highlight certain features of your app that the user might miss out on if push notifications are not enabled. The timing of this conversation is critical. If you trigger the request too early (for example, first session start) the user is likely to decline permission because they don’t know anything about your app. It is best to trigger the message when you’re confident the user has had a good experience with your app and understands why it’s important to accept push notifications. The Contacts Opt-In template enables you to create a message requesting the user’s permission to allow the app to access their contacts. Like the other permissions templates, use this template to highlight the benefits of allowing access to their contacts. Similarly, trigger the display of this message at an appropriate time when the user best understands and appreciates those benefits. The Rate My App template enables you to create a message that encourages users to rate your app in the app store. You can edit the image and text placeholders as needed, and customize the buttons, including adding a deeplink that takes users directly to the app store to rate your app. If you provided an app store URL for your app on the App Settings screen, then the button deeplink defaults to that URL. The Track Location and Track Movements templates enable you to create a message requesting the user’s permission to allow the app to enable location services on their device, either only while the app is running (Location) or at all times (Movements). Like the other permissions templates, use this template to highlight the benefits of enabling location services. Similarly, trigger the display of this message at an appropriate time when the user best understands and appreciates those benefits. The Photo Permissions and Camera Permissions templates enable you to create a message requesting the user’s permission to allow the app to access their device’s photos or camera. Like the other permissions templates, use this template to highlight the benefits of allowing access to their photos or camera. Similarly, trigger the display of this message at an appropriate time when the user best understands and appreciates those benefits. Edit the content of your Conversation using the Conversation editor. For more information, see Editing Conversations. View the Conversation results on the individual Conversation screen. For more information, see Managing Conversations.